Export quality rubber moulds for parking tiles . 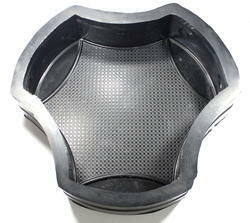 JR Rubber Moulds is the most sought after in the industry. ØSTRENGTH AND DURABILITY SIMILAR TO AUTOMOBILE TYRES. AS THE PAVER PRODUCTION DOES NOT INVOLVE ANY VIGOROUSAPPLICATION AS TYRES THE LIFESPAN OF MOULDS IS INFINITE. ØOUR CUSTOMERS WHEN PROCURING MOULDS EXPECT FOR A LIFESPAN OF 4-5 YEARS.BUT ACROSS THE GLOBE OUR RUBBER MOULDS ARE USED FOR OVER 10 YEARS CONTINUOUSLY.